I decided to watch the 1951 classic sci-fi film "The Day the Earth Stood Still" tonight. The reason for this sudden trip into nostalgia was that I have been notified of some disturbing developments in Hollywood. Yes, you guessed it... there's another remake of a vintage on the cards. I'm way too young to remember the original film, my mother was still a toddler when it came out... so I was definitely just a twinkle in my daddy's eye! However, having seen it... I honestly can't see the need for a remake. The central message of the film is still relevant today, it doesn't require reinterpreting or re-imagining. OK, so the effects are well wobbly by modern standards... but the acting and the plot line are top standard. The film's protagonist is Klaatu, an alien visitor from a distant planet... who comes bearing a message of peace and goodwill to mankind. However, along with this he brings a stern warning that Earth must abandon the use of atomic weaponry (not atomic power mind). His people had not interfered in human conflict before, because it had not threatened to spread beyond our borders. However with the advent of ballistic missiles, this attitude changed....and his message is simple - repent or see Earth reduced to a cinder. 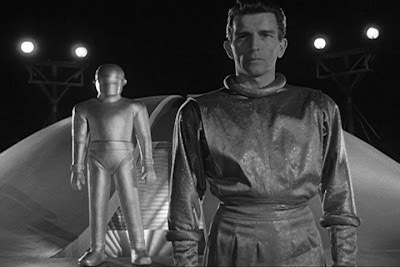 Being a peace loving civilization, Klaatu's people treat war and violence with zero tolerance and built a race of super robots (of whom Gort, his silent companion is one), to police themselves... and they respond to any act of aggression with unlimited power. "I am fearful when I see people substituting fear for reason." Why is it we allow ourselves to live under the leadership or threat of leaders and terrorists who irrespective of their aims and objectives... have actively encouraged that very principle? That of encouraging people to substitute fear for reason? Back to the film and according to this source, Keanu Reeves has been signed to portray Klaatu. This is a mistake, it is beyond his ability as an actor. It's one thing to portray heroic characters in an ensemble cyberpunk movie (and don't get me wrong, I like The Matrix... I like it a lot), but this film is a totally different animal. It isn't an all out action shooter and it requires gravitas and eloquence.. and for the central character to pretty much hold the film together on his own strength. I do not believe Reeves has this range. It is clear to me that the producers took one look at The Matrix and another at The Day the Earth Stood Still... and concluded that since Reeves had played a messianic character who had returned from death in one sci fi movie which made a lot of money... he'd automatically be able to do the same thing again. However, like I said... the philosophies of these films are very different and Klaatu and Neo are not the same character. "I am leaving soon, and you will forgive me if I speak bluntly. The universe grows smaller every day, and the threat of aggression by any group, anywhere, can no longer be tolerated. There must be security for all, or no one is secure. Now, this does not mean giving up any freedom, except the freedom to act irresponsibly. Your ancestors knew this when they made laws to govern themselves and hired policemen to enforce them. We, of the other planets, have long accepted this principle. We have an organization for the mutual protection of all planets and for the complete elimination of aggression. The test of any such higher authority is, of course, the police force that supports it. For our policemen, we created a race of robots. Their function is to patrol the planets in spaceships like this one and preserve the peace. In matters of aggression, we have given them absolute power over us. This power cannot be revoked. At the first sign of violence, they act automatically against the aggressor. The penalty for provoking their action is too terrible to risk. The result is, we live in peace, without arms or armies, secure in the knowledge that we are free from aggression and war. Free to pursue more... profitable enterprises. Now, we do not pretend to have achieved perfection, but we do have a system, and it works. I came here to give you these facts. It is no concern of ours how you run your own planet, but if you threaten to extend your violence, this Earth of yours will be reduced to a burned-out cinder. Your choice is simple: join us and live in peace, or pursue your present course and face obliteration. We shall be waiting for your answer. The decision rests with you."